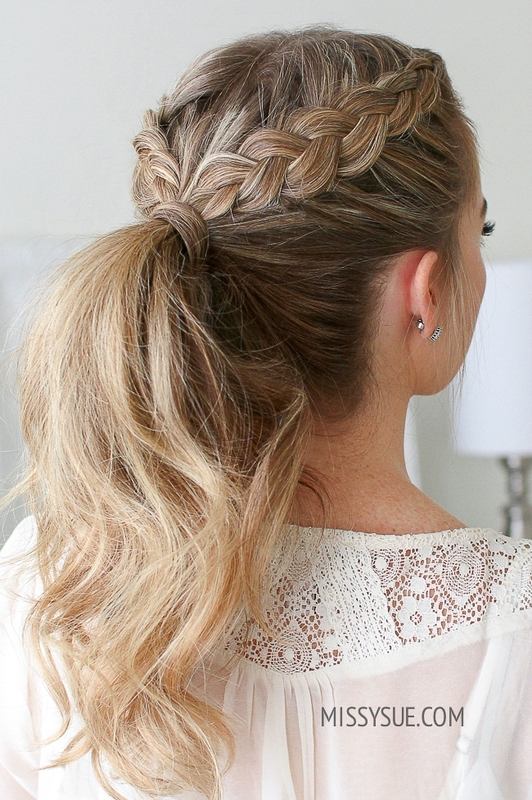 I love throwing my hair into a ponytail during the hot, summer heat. 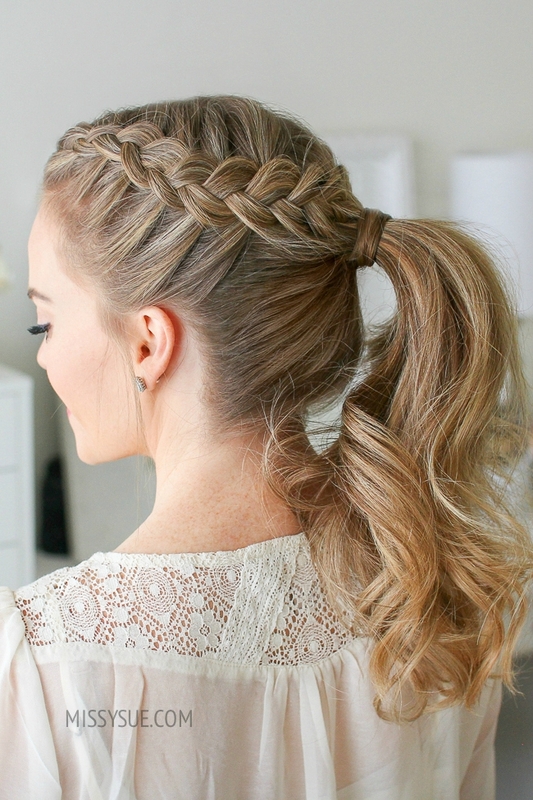 Tossing in two dutch braids is a super, simple way to make your everyday pony a little extra cute. This style works best on second or third day hair when it’s a little too dirty to wear down but not dirty enough to commit to a messy bun. Step 1 / Begin by parting the hair slightly off center. Step 2 / Pick up a section on the left side of the head and divide it into three smaller pieces for the dutch braid. Step 3 / First cross the right strand under the middle, then cross the left strand under the middle. Step 4 / Now cross the right strand under the middle, pick up a new section of hair and cross it under and into the middle. Step 5 / Then cross the left strand under the middle and bring a new section into the braid. Step 6 / Now repeat those steps continuing the dutch braid, adding in hair to both sides of the braid, working towards the back of the head. Step 7 / Once the braid reaches the back of the head and hair is brought in from behind the ear, stop adding new pieces into the braid and continue braiding the section a little further down before sliding a bobby pin over the bottom. 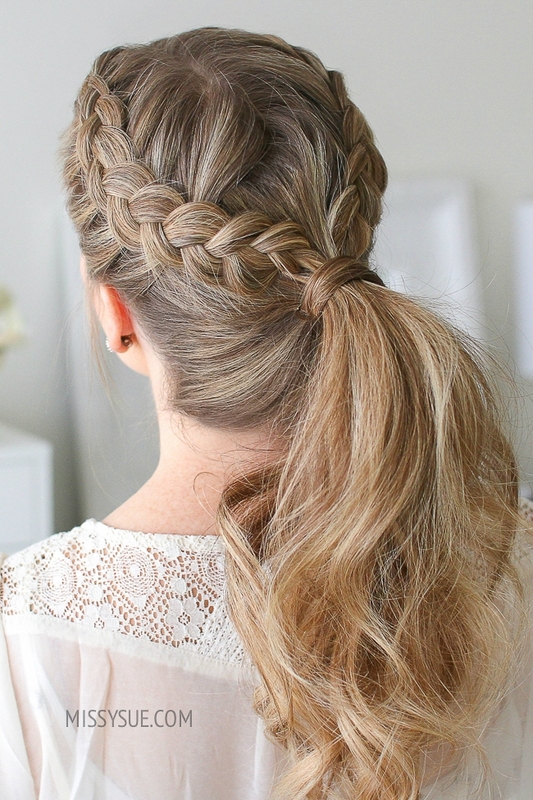 Step 8 / Then repeat those exact same steps and create a second dutch braid with the hair on the right side of the head. Step 9 / When both braids are done, combine all of the hair together into a high ponytail and tie it off with a hair band. Step 10 / Go back over the braids, pulling on the edges just to make them a little fuller. Step 11 / Take a small section from the ponytail, wrap it around the hair band and secure it underneath with a bobby pin. Step 12 / Set the style with hairspray and smooth down any flyaways. You read the article Double Dutch Braid Ponytail. All materials on the site Fsetyt com, as well as the article Double Dutch Braid Ponytail - written with the purpose of enriching the information and we will be glad if you like our magazine.